I received an order to make matching focal length mirrors for a binocular, and the project intrigued me so much I took it on. Originally, the plan was to use a single tool to grind two mirrors going back and forth between them to keep the focal lengths as equal as possible. But a different plan hit me. It may work, it may not, but I have to try it. If it fails, I’ll return to the standard method as mentioned above. The order was for two matching 6” f/7 paraboloids. My plan is to place three 6” disks onto a curve-generated 13.1” mirror blank with blocking pitch and then grind them as one single optic. The 13.1” mirror blank was curved to an ROC of 85 inches, and so when I placed the three blanks onto it their fronts will have an ROC of about ¾” shorter, just over the 84” ROC needed. I curve-generated a 10” tool to an 85” ROC. I then fixed-posted ground the 10” tool with the 13.1” mirror blank. If the image below you can see each f the mirrors attached to the lower glass are tilted. Next I used blocking pitch to secure the three 6” discs onto the 13.1” mirror. They are already tilted with their optical axes pointing toward the center of curvature of the 13.1” master substrate. The 6” mirrors have an extremely short sagitta, so I did not pre-curve-generate them, but I beveled their edges well and started slowly. 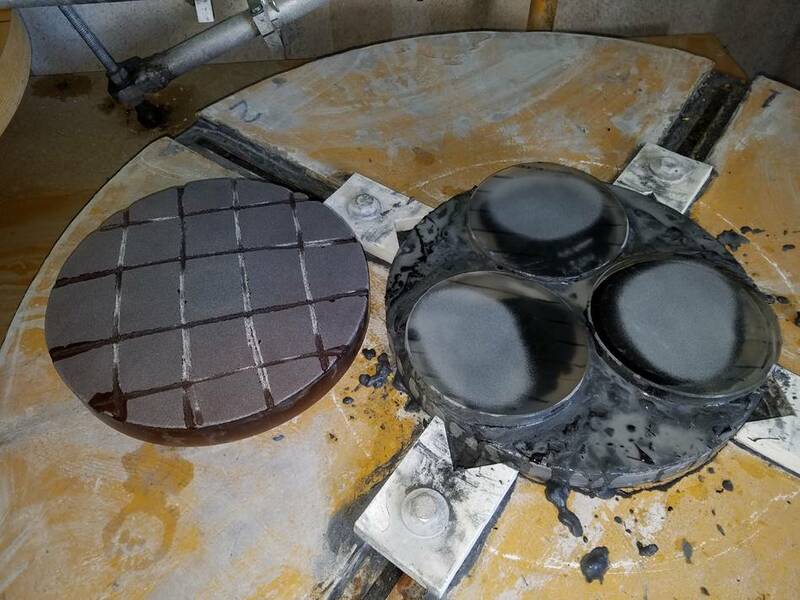 I’ll fixed-post grind them as if they were a 13.1” mirror starting with 60 grit silicon carbide. Once ground I’ll progress through the grits as usual, 120, 220, 500, then on to aluminum oxide with 12, 5 and 3 micron. I wanted to check to see if there was similar grinding on each blank and if the initial grinding started in the centers to avoid wedge. There is a bit of wedge developing, but for 6” f/7 I don’t think it will be a problem. Larger mirrors might have issues. I drew Sharpie pen lines on both the mirror set and the tool. The tool is totally worn away, so it is getting good action. The mirror sets are showing a bit of tilt. I do not want to polish them combined like this, mainly because I don’t’ want to mess with casting a pitch lap of a 10” tool with three 6” mirrors, that’s weird. Also if there were zoning issues, each mirror would have those zones not surrounding their individual optical axes but rather the center of the triangular array of the mirrors. Not cool. So I will separate them and polish them individually. It is possible that even though they will have identical ROCs after grinding, they may not have after polishing. So I will select the two that are closest to each other and send them to the customer, and keep the third as an “in-stock” item. The 13.1” mirror under them will also be ground, polished, parabolized and sold. If this works out as well as I hope it does, I have no reason why not to attempt this with larger mirrors. As an upper limit in my brain right now, I can see three 22” f/5 mirror sitting atop a 36” f/3 mirror for the same purposes. I suppose a more reasonable set of examples would be 8” mirrors atop a 17.5” base and 10” mirrors sitting atop a 22” base, but larger is cool. Putting three 22” blanks atop a 36” blank and having a shop disaster would be a financial deal-buster. Not ready for that yet. But I’m thinking about it. I may advertise this as being a new niche for me if this works out. 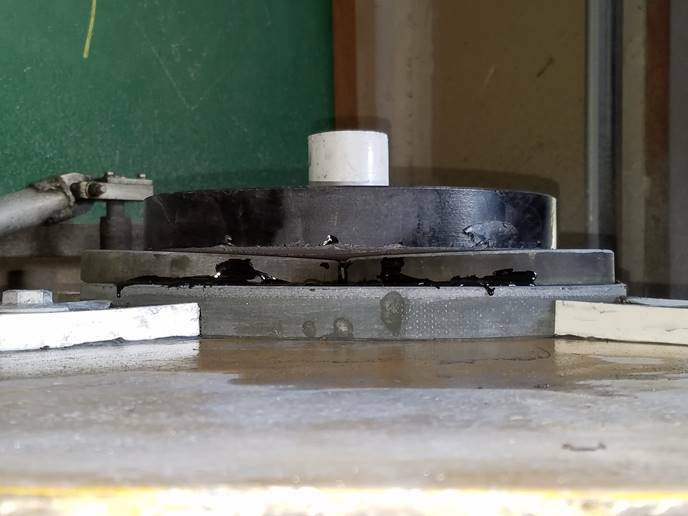 I found that the triangular gap in the center is a place for grit to wash off the work and after only two turns there is no more grit on the glass. So a huge amount of grt is used to do a tiny amount of work. I was puling “mud” off the sides to reapply so to save on grit, but that sucked. Since I have a large amount of material to grind away in the center of the system that was going to take forever and use too much grit. So I poured more blocking pitch into the central triangle to fill it in hopefully to keep this from happening. Here is a shot of the mirrors after a bit more work and before filling in the middle. Notice that one mirror is grinding well, but two are not placed on the backer sphere perfectly against it and the mirrors are not grinding from the centers but a bit off axis. This will result in tilt. If these are 20” mirrors, I’d be re-dong this. But tiny little 6” mirrors with slight wedge is not a deal buster, especially since they will be interferometrically tested. 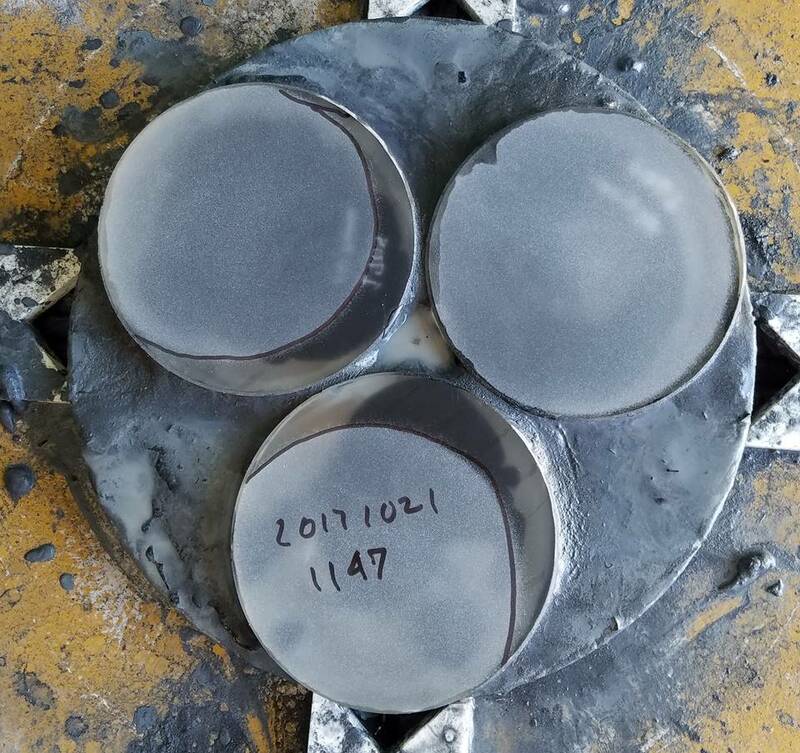 Once all ground, there will be many opportunities to Sharpie test to make sure they are grinding right and fully everywhere, hopefully implying a sphere. Know this all looks bad but I’m having a blast processing this method.